In the past few years, the majority of IT managers followed a strategy to introduce an IT change and release management application in order to ensure the quality of the IT environment for the future. 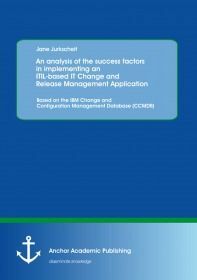 The present book investigates if the implementations of the given success factors are leading to a successful implementation of a workflow-based IT change, and release management application. Moreover, further success factors will be introduced and discussed. First, the author discusses the HR change management in relation with the eight step model of Kotter, and the outcome of its critical success factors in business. Secondly, the effectiveness of the ITIL® reference model is explored in a research study. The ITIL® reference model defines critical success factors for a successful IT change and release management implementation. The book uses for its purpose the ITIL® reference model, the process issues publications of the official ITIL® source and the literature of Laudon & Laudon. In addition, other important researchers are taken into account. The findings are integrated into the questionnaire and the interviews, and further, they are used for an initial assessment.